Obverse: Vignette of Roger Boscovich and his name with lifetime at centre with geometrical calculations at upper right also Coat of arms at top right corner. Republic of Croatia written in Croatian at left with signatory of the Minister of Finance at lower left. Prefix and serial number at upper right. 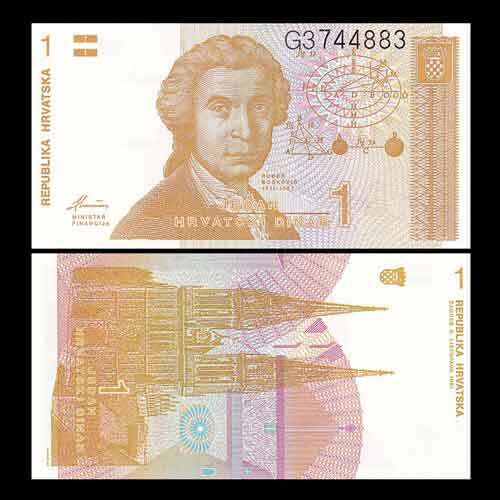 Numerical denomination at the top left corner and lower right with the denomination in words in Croatian at the centre bottom. Reverse: Zagreb cathedral and artistic rendition of city buildings behind on vertical back. The Republic of Croatia in Croatian on left and Coat of arms at the bottom left. Numerical denomination at the bottom left corner and upper right with the denomination in words Croatian beside it.